The time a helicopter pilot spends recognizing and reacting to an engine failure contributes directly to the survivability of the emergency. HeliTrak’s Collective Pull Down (CPD) device was designed to help eliminate the potential of a pilot’s delayed, and subsequently catastrophic, reaction. After detecting the low-rotor RPM warning signal, the device cues the pilot by automatically lowering the collective in less than half a second. HeliTrak’s motive behind the design is to improve the probability of a successful outcome if the aircraft experiences a sudden loss of rotor RPM. HeliTrak (Booth N6210) received STC approval for its CPD products in 2016 and began initial installations in the Robinson R22, followed by the R44. Not including installation, the R22 unit costs $9,950, while the R44 unit is $14,950. The device is lightweight—less than two pounds—and intended for quick installation. Pull-down force on the collective ranges from five to 10 pounds, with the setting selection at the discretion of the operator. “Even though operators can make different force selections during installation, it is still going to provide the same response,” said HeliTrak president Chris Nehls. I was able to experience the Collective Pull Down system on a demo flight of a Robinson R44 equipped with HeliTrak at North Las Vegas Airport Monday afternoon. Before takeoff, HeliTrak demo pilot and vice president of engineering Ray Debs pointed out the features that had been added to the cockpit to support the CPD system. 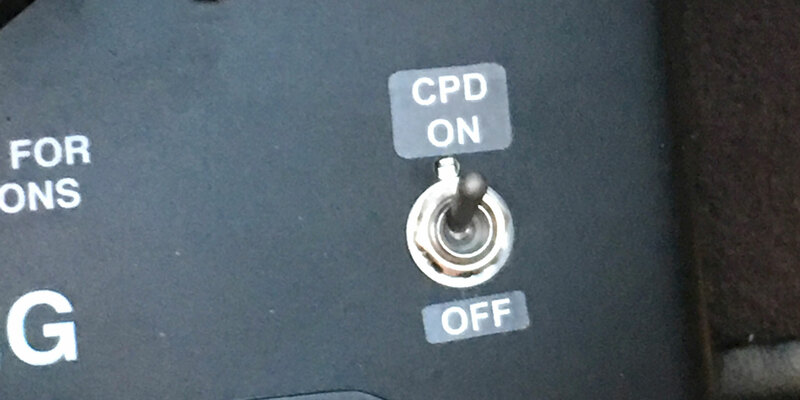 An indicator light labeled “CPD” was located just below the vertical speed indicator, while a toggle to switch the CPD on and off was to the right of the base of the cyclic. The other clear sign of the CPD addition was the cable extending from the midpoint of the underhand portion of the collective into the panel below. Debs demonstrated how to recycle the toggle switch and explained that upon detection of low-rotor RPM, the CPD only fires for three seconds and then stops. As it stops, the release on downward pressure is gradual. After the CPD has fired, it must be reset in order to be reactivated. After departing North Las Vegas Airport, we headed out to begin the demonstration over an area of open fields. Debs performed a few different autorotations to provide me with an understanding of how the CPD functions and feels. Following along with him on the dual controls, the force of the collective in my hand when the CPD fired was certainly noticeable, but manageable. The force of the CPD in this particular aircraft was set to nine pounds. After handing over the controls, Debs guided me through autorotation entries and the pull of the CPD, while still apparent, became less of a sensory factor with each entry. With the CPD armed, the unit will fire when it detects the rotor RPM at 97 percent, but the pilot can override the system without physical strain. Debs demonstrated this by entering an autorotation and then extending our glide by pulling the collective up to 90 percent. I could feel the initial resistance of the CPD, but it gradually released and allowed for successful completion of the maneuver. After our return to the airport, I spent time on the ramp with Nehls and Debs discussing the flight and presence of the CPD in the market. “We want more people to start understanding what the CPD is and how it can help them,” said Nehls.